My lobes are currently at 16mm so the headphones go in and out really easily and I found that it’s also a convenient size to use the headphones as lobe speakers, haha. When I originally done it I was only at about 12mm so my lobes stuck out a bit. i think i’ll probably keep on doing it from now on as it looks quite good and it’s a good place to hang them if I need to take them out to speak/listen to someone. M really highlights the main benefit of this trick: the earphones remain captive and in close proximity to your ear if you remove one or both. Unlike headphones, which can rest around your neck when you take them off, you usually have to chase down and possibly untangle earphones whenever you try to put them in again. I enjoy using earphones. They’re discreet, provide superior noise isolation, and give you the option of only having one in at a time when you are frequently talking to people. Of course there are some safety issues with hanging long snaggable cables from your lobes. I think there are a few ways to mitigate the danger: You can thread the cables through your clothing to reduce the amount of exposed cable that can be snagged. You can anchor the cable to your collar with a clip to change where the force of the pull is applied. You can use a breakaway Replug on the device to unanchor the cable when snagged. You could use a tunnel in the outer conch instead of the lobe to provide strain relief. The cable would route above the ear canal and force would be applied to cartilage instead of skin. This is what an outer conch tunnel looks like. Finally, you can use earphones that have a removable cable. Here are two examples of earphones with removable cables: Panasonic’s RP-HJE900 and Sleek Audio’s SA1. I like the idea of removable cables for two reasons: If they do get snagged, they might breakaway safely. Also, the cable is much smaller than the actual earphone so it can pass through smaller flesh tunnels. I’ve been focused on canalphones because I love my Apple In-ear Headphones I purchased over a year ago. The price is great for the quality and they replaced my bulky Sony MDR-V500DJ over-ear headphones which had ailing joints. The downside of using canalphones with tunnels is that you won’t get the same lobe-speakers effect as M does with his stock Apple earbuds. My experience with canalphones is that they need the tight seal with your ear in order to produce adequate sound (particularly bass). My fascination with this idea is deeply seated in its cyborg appeal, bringing flesh and technology closer together. Placing the earphones through the tunnel gives them more permanence in relation to the body; an add-on as opposed to an accessory. The majority of digital audio I hear on a daily basis is intended just for me so why shouldn’t I have a more direct path to getting it into my brain? We are moving in this direction. Cochlear implants that directly stimulate the auditory nerve fibers in the cochlea have existed for nearly 30 years and I foresee the fidelity eventually becoming so good that people will start having similar technology implanted electively. If you’d like to know more about cochlear implants, I suggest reading about Michael Chorost’s quest to hear Bolero again (found via Gizmodo). Will I be tunneling my lobes? Most likely not. I hope to post about more wearable tech in the future though. I’ll let you know if I convince @doctorparadox to shove earphones through her lobes though. 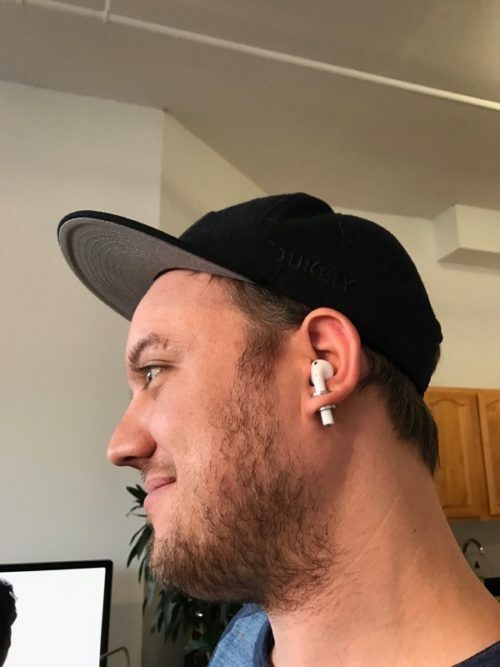 UPDATE: In 2016 Apple released the wireless AirPods and Andrew Cornett put them through his tunnels. Thank you so much for wrtiting about this! For me its also a fascinating and interesting idea to stretch your ears to hold your headphones!